Congratulations to Addison Goldberg and Steve Wasilczuk for their stints as trivia Grand Master and trivia Grand Master’s sidekick, respectively, for this year’s edition of the Lawrence trivia weekend. These two were in my Freshman Studies class once upon a time, and I still have some documentation from that class to share with them upon graduation. Once the bacon is in the pan, add just enough water to completely coat the bottom of the pan and cook over medium-high heat until the water has evaporated. Reduce the heat to medium and cook the bacon until crisp. For higher-volumes of bacon, however, I recommend that you forego the stove top altogether and put the bacon into the oven. It doesn’t get any easier than this: cover a cookie sheet with tin foil, put the strips on top, pop it in the oven at 400F, and 15 minutes later the deed is done. Once again, congratulations to this year’s trivia masters, and we’ll see you back here next year for the 50th. And here’s the Lawrence Minute! Brings to mind some of the happiest moments of my childhood… thanks, NYT! 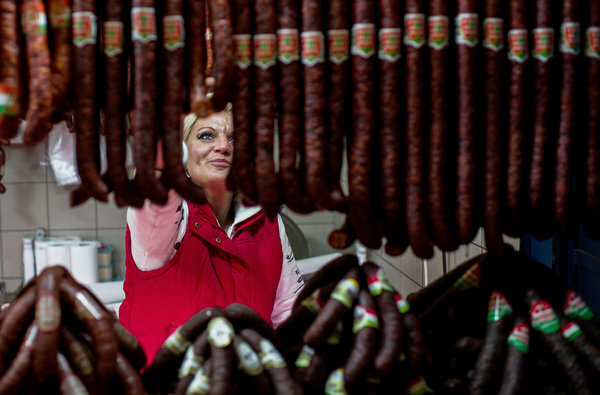 Hungary rarely gets on the front page of the New York Times, but the new Hungarian tax on fatty, sugary foods was such a bold step towards a healthier Hungary that even American journalists took notice. While the justification for the tax is the national need for a leaner populace, the real reason is probably the government’s need for a fatter treasury. Those of you taking Comparative Economic Systems are probably crying “soft paternalism!” right now. Or “hard paternalism.” As to the financial consequences: if the tax really cuts down on the consumption of unhealthy foodstuffs, not only will there be little revenue generated form the tax, but the very low Hungarian life expectancy will rise, costing the state more in health care expenditures. Continue reading Goulash capitalism? This column argues that alleged experts repeatedly cannot tell a superstar wine from a cheaper bottle. The important conclusion of the ranking, as analysed by Richard Quandt from Princeton, is that Clos des Mouches is statistically significantly better than the nine other whites, which are all judged of equal quality, while one New Jersey red wine is statistically worse than all other nine reds. None of the remaining wines, whether French or from New Jersey, is statistically different from the other. This implies that Château Mouton-Rothschild and Château Haut-Brion, two French superstars, cannot be distinguished from New Jersey reds, which cost only 5% of their French counterparts. The bold is mine, indicating a bold conclusion, indeed. Ginsburgh, the only writer of this paper who contributed nothing to the Judgment of Princeton, wants nevertheless to point out that he did not even know that New Jersey produces wine. Here’s some more on the situation in Greece. When I see a blog post titled “The Scariest Chart in Europe Just Got Even Scarier,” I typically think the author is invoking some grand hyperbole. Thompson points us to a link that draws this conclusion: “Spain is doomed and Greece is toast.” Of course, last year we pointed to Michael Lewis’s similarly dire predictions for Greece, where he observes “the closer you look, the worse it gets.” He concluded Greece is simply incapable of reform in its current form. That unemployment bar looks like a big fuse. If you happen to be walking across campus and you notice a guy in a hot dog suit (or maybe it’s a gal in a hot dog suit? ), it’s because Griff’s Grill is making its triumphant summer reopening Wednesday. If you like bratvurst and carrot sticks, this will be a little slice of heaven for you. Summer hours for the Grill and Cafe. If you believe that Tyler Cowen has appropriately declared the end of serious economic growth in the so-called “developed world,” check out the work of Peter Diamandis. If you fervently disagree with Cowen’s view, also check out Diamondis. In Abundance, the Future is Better than You Think, Diamondis (with co-author Steven Kotler) calls upon human ingenuity and innovation as the drivers of future abundance. No Peak Oil here. He reminds me of Julian Simon (the Ultimate Resource ) who challenged Paul Ehrlich (The Population Bomb) in a famous 1980 bet on the price of various metals and natural resources. Spare the 16 minutes it takes to watch Diamandis give a Ted talk. Today marks the opening of a summer ritual here at Lawrence, Griff’s Grill on Boldt Plaza. Mr. Griff will be out there grilling and spreading joy every Wednesday this summer, 11:30 AM – 1 PM. The menu is your basic hot dogs and brats, and featuring the alleged largest mustard bar north of the Mason-Dixon Line. The founder and big pickle behind the Jimmy John’s enterprise is threatening to take his fixins and go elsewhere, this according to the Champaign News-Gazette. Mr. Jimmy John (Jimmy John Liautaud) is upset about the steep tax hikes enacted this past week by the Illinois state legislature — raising the personal income tax from 3 to 5 percent (67% increase) and corporate taxes from 7.3 to 9.5 percent (30% increase). This story has some personal interest to me, as I was in Champaign when he opened up one of his first shops back in the late 1980s. I still recall one of my (more obnoxious) friends — impressed by the deliciousness of the Jimmy John’s sandwich — on the phone trying to bribe providing cash incentives for the workers to bring him an order outside of their regular delivery area. Not too many years later, Jimmy John’s has gone from a couple of sandwich shops in east central Illinois to a big corporate supporter of everything from NASCAR to University of Illinois athletics. Friend, that’s a lot of sandwiches. If he indeed packs up corporate shop and heads elsewhere, it will certainly impact the local economy in some fashion. Some people may not realize how many travel to Champaign-Urbana as a result of Jimmy John’s being here – many of them for training. Jimmy John’s offices occupy 23,000 square feet on Fox Drive, and Liautaud said he had considered buying a 20,000-square-foot building just north of those offices. Those plans went out the window with the tax increase, he said. As far as the national economy goes, it probably doesn’t matter where Jimmy John sets up shop, if Champaign doesn’t enjoy the benefits, someone else will. But, I wonder what sort of elasticity the legislative analysis used to estimate business leaving the state when they put these tax increases together? If you don’t find abstract mathematics palatable, try this one. 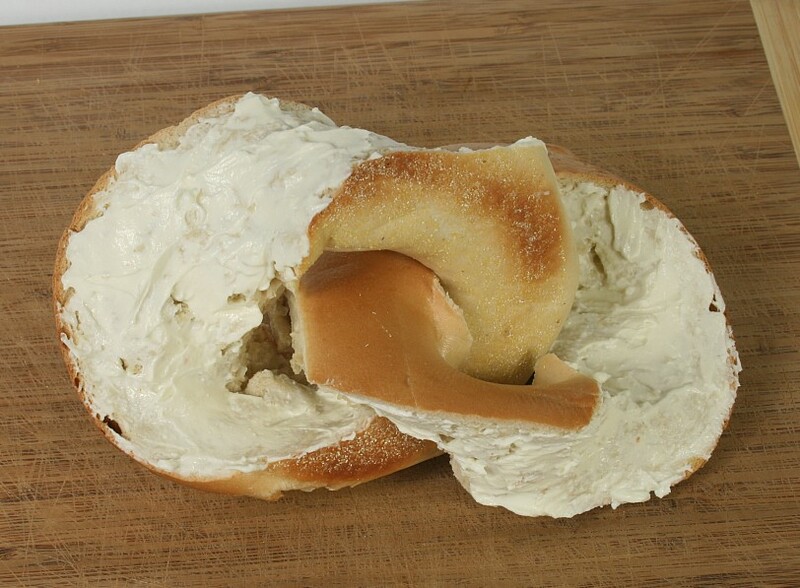 Thanks to George Hart, Chief of Content at The Museum of Mathematics, we finally have proof: it is possible to slice your bagel into two and produce two linked, unbroken halves of this delicacy of Jewish origin (its name comes from Yiddish “beygel”). The proof is constructive. Posted on December 10, 2010 December 10, 2010 Author Adam GalambosCategories Fishy fishy fishy fish, In Case You Were WonderingTags Food for thought, Mathematics, Möbius strip1 Comment on Mazel tov! "The cake can rise about that much, max"
Some of you may recall my earlier post on Nathan Myrhvold, one of the great renaissance men geniuses of our age. I follow that here with a tip to check out his TED talk on what he’s been up to of late. 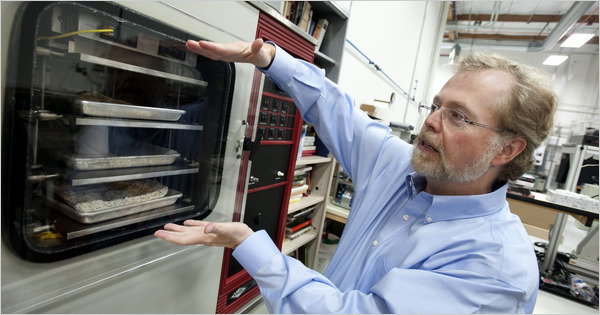 His topics range from animal photography of spawning whales to digging up dinosaurs to cooking up some world-class barbecue. (As an aside, the first few minutes on penguins is scatologically hilarious). Mr. Myrhvold is back in the news for his new $500 cookbook that looks absolutely fantastic. As one of my friends puts it, “It’s exactly the kind of cookbook you’d expect the CTO of Microsoft to write.” The cookbook stems from a long-running interest in cooking, including taking a leave of absence from Microsoft to go to chef school if France. In his TED talk, he shows a picture of the cooker he’s engineered that he claims is more complicated than the nuclear reactor he designed. If the cookbook is $500, I wonder what the oven goes for? And, is there anyone other than Myrhvold that can repair it? For those of you who don’t know the (possibly apocryphal) tale, John Kruk was a rather fat man with a mullet, who could hit a baseball better than most people in the world. Kruk’s view was that it wasn’t any “athletic” gifts, per se, that allowed him to hit so well, but rather his crazy hand-eye coordination and phenomenal reflexes. After a game, a woman spotted him smoking a cigarette and she started to give him the business about how an athlete shouldn’t smoke, his body is a temple, to think about the kids, and on and on. His infamous response is the title of his autobiography. Lady, I don’t know about that sort of thing — I’m an economist. Or perhaps that’s what we economists are supposed to do — study the economy. Well, I guess that’s one answer, but I don’t think it’s my answer. I mean, I know something about what’s going on with the fiscal stimulus and the multiplier effect, but as Robert Barro points out, that it certainly not what I do. Should Ideas Be Left to the Free Market? In the market for goods, the government is commonly regarded as competent to regulate and properly motivated. Consumers lack the ability to make the appropriate choices. Producers often exercise monopolistic power and, in any case, without some form of government intervention, would not act in a way which promotes the public interest. In the market for ideas, the position is very different. The government, if it attempted to regulate, would be inefficient and its motives would, in general, be bad, so that, even if it were successful in achieving what it wanted to accomplish, the results would be undesirable. Consumers, on the other hand, if left free, exercise a fine discrimination in choosing between the alternative views placed before them, while producers, whether economically powerful or weak, who are found to be so unscrupulous in their behavior in other markets, can be trusted to act in the public interest, whether they publish or work for the New York Times, the Chicago Tribune or the Columbia Broadcasting System. Coase wrote the piece in the early 1970s, partly in response to federal regulation of commercial advertising, wondering whether there is a difference between firms schlepping products via commercial advertisements in the goods market is really any different than an article or an editorial in the New York Times. Coase challenged two assumptions that, he says, have created the distinction in public policy: 1) that consumers are able to distinguish good ideas from bad on their own, though they need help in choosing among competing goods; and 2) that publishers and broadcasters deserve laissez-faire treatment while other entrepreneurs do not. It might be tempting for us to dismiss Coase’s argument as glib posturing, or as an example of economists being too clever for our own good. But how we define and constrain free speech is a central element of our political system. President Obama, in fact, spent his weekly radio address admonishing the recent Supreme Court decision that removed many legislative controls of corporate campaign financing. One would suspect that Coase was arguing to relax regulation of the goods market, not extend regulation to the ideas market, but the proliferation of the internet and other news sources has perhaps muddied the waters so much that the distinction is unrecognizable. So, more to come, I suspect. Posted on August 23, 2010 March 22, 2011 Author David GerardCategories General InterestTags Food for thought, Free Market Monday, Stuff I Nick from O&M1 Comment on Should Ideas Be Left to the Free Market?